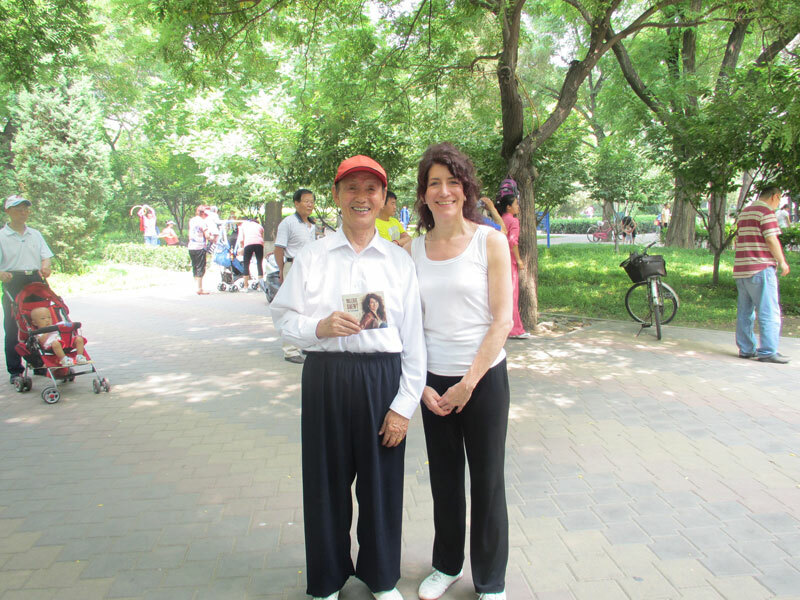 Today I learned my first Chinese folk song, in the park where we train ba gua zhang every day with Master Gao Ji Wu. We were introduced to this particular student of Master Gao’s when we first started training here – and Master Gao made a point to tell us that this student is 81 years old. His student approached me today and said (in Mandarin of course), “I heard you are a musician, a singer. Can you sing a Chinese song for us?” I told him through our translator that unfortunately I don’t yet know any Chinese songs, but if he could tell me the name of his favorite song I would learn it and sing it for him the next time we come to Beijing. He then said, “I sing, too!”. So I asked him if he would like to sing for us. He sang a beautiful song called “In That Far Away Place”: “In a far away place there is a good girl, everyone turns to look at her when they are passing by her tent. Her smiling face looks like the sun, her charming eyes look like the moon”. After he sang it, I picked up the melody and began singing, he joined in and we happily sang together with him saying the words and me staying on the melody as best I could. Here’s a short video of us singing together for the first time – I hope you enjoy it as much as we did! Afterwards I just had to give him a copy of my new CD – and he wanted to post for a photo together, holding up Day to Day Dream. Now that I basically know the melody to this lovely folk song, our translator is going to write out the words for me so that we can sing together on Sunday. Stay tuned for our first performance, singing in a Beijing park, live from China!